Intel today released their mainstream answer to users' fast, NVMe-based storage needs, the SSD 760p. We've already covered this new consumer, mainstream SSD series in our news pieces; however, information and press decks have now come directly from Intel, allowing us a clearer picture of how Intel sees its products to fit into the consumer market - and hopefully, in consumer's choices. 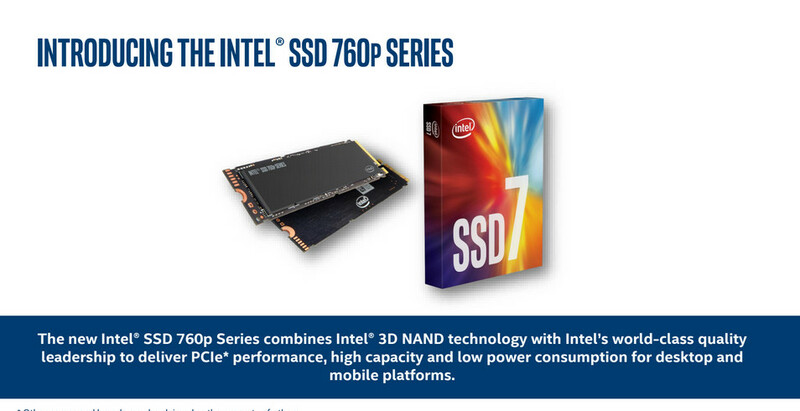 The Intel SSD 760p series features the company's own 64-layer, TLC 3D NAND, which Intel claims is more advanced than the competition's, offering up to 20% areal density, and increased GB per wafer (which should theoretically translate to lower costs for end users). Intel is quoting performance that's up to 2x faster than the company's previous SSD 600p, while consuming just half of that series' power, and offering NVMe performance at near-SATA pricing. These will come in the M.2 form-factor in capacities ranging from 128 GB to 2 TB, offer up to 3,230 MB/s sequential read and 1,625 MB/s sequential writes, with up to 340K IOPS Random Read performance and up to 275K IOPS Random Write. Cheaper than the Samsung 860 Pro SATA drive and cheaper than the 600p. Not a bad deal by the looks of things, even though it's not a super high-performing drive, it's still generally way ahead of SATA drives. Just an FYI none of the recent SSD benches (even on AT) include the spectre/meltdown fix, so hold on to your hats & take the results with a pinch of salt. Intel 600P was sole reason I was forced to upgrade to 960 EVO which has been remarkable. My Samsung 960 EVO excels everywhere 600p lags behind and intel never released further firmware updates. I am in need of a bigger SSD and 760p specs on paper looks promising, but not sure if I am willing to give 760p another trail run. Might wait for Samsung 970.